Of course, as with anything related to medical device development, there are regulatory requirements that companies must follow. In the case of customer complaints, you need to refer to FDA 21 CFR 820.198 and ISO 13485:2016 section 8.2.2. You are required to maintain complaint files as well as have clear procedures for receiving, reviewing, and evaluating complaints by a formally designated unit. Complaints must be investigated in a “uniform and timely” manner and you are required to evaluate whether or not the complaint warrants reporting to regulatory bodies under FDA 21 CFR Part 803 and/or ISO 13485:2016 section 8.2.3 requirements. When you are inspected by the FDA and audited by ISO registrar, how you manage complaints is bound to be something that they want to look at. Failure to adequately put complaint procedures in place has been a relatively common reason for the issuance of a warning letter. 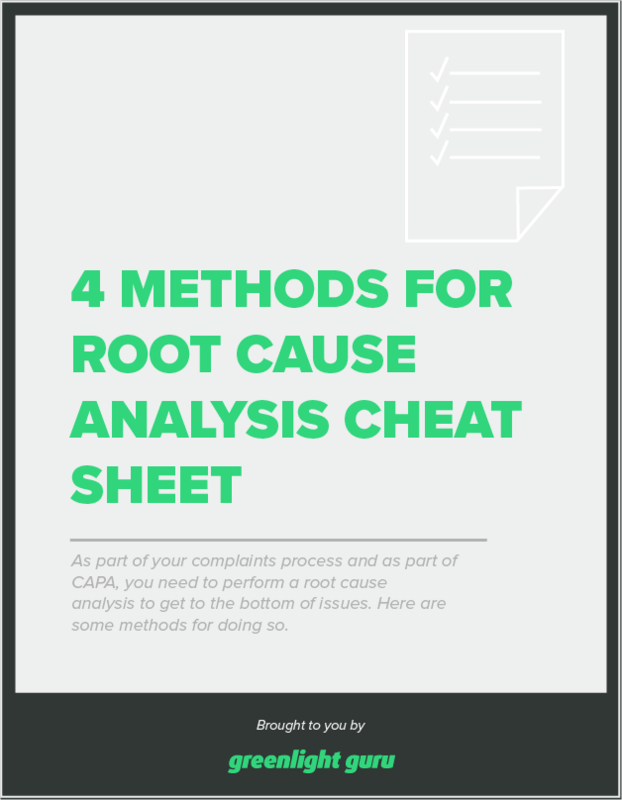 Free Bonus Giveaway: Click Here to Download Our Free 4 Methods for Root Cause Analysis Cheat Sheet. 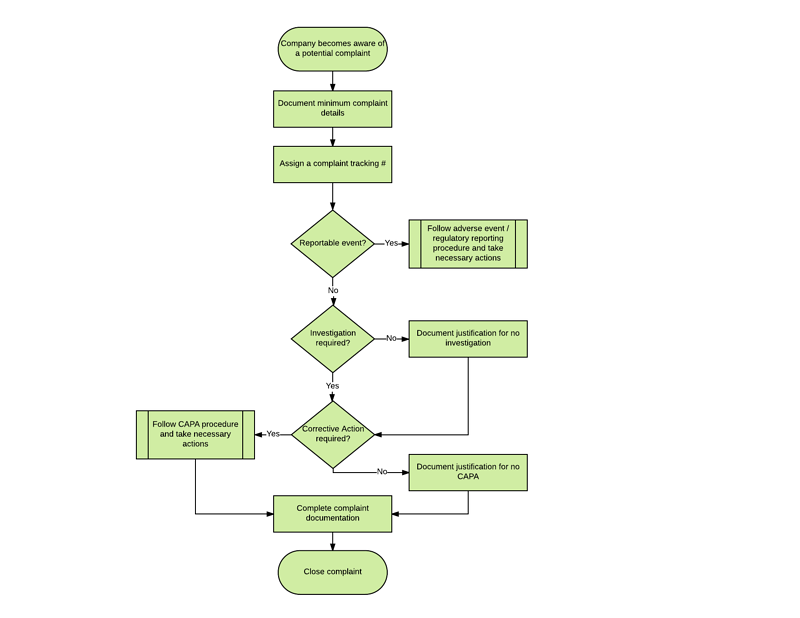 The first thing you need to do is to actually adopt a complaint handling procedure and commit documentation to it. As part of your QMS, remember that you need to be able to prove that you are keeping adequate records and that you have a clear procedure in place. A complaint is related specifically to a medical device company’s product(s). "Complaint" is defined as any written, electronic, or oral communication that alleges deficiencies related to the identity, quality, durability, reliability, safety, effectiveness, or performance of a device after it is released for distribution. Is this a reportable event that needs to be submitted to regulatory bodies (i.e. FDA)? Does this complaint require an investigation? Is additional corrective action required? As for the reportable event question, the requirements for regulatory reporting are laid out in FDA 21 CFR 803 Medical Device Reporting (MDR) regulations and ISO 13485:2016 section 8.2.3. In short, as a manufacturer, you are required to report any incidents where you learn that your device may have contributed to serious injury or death, or malfunctioned in such a manner as would be likely to cause serious injury or death should a similar malfunction happen again. That last point, “user error” is one that gets a lot of questions. Do I really have to file a MDR when it was due to user error? The answer is, yes you do. Did a serious injury or death occur because of the user error? Is there potential for serious injury or death should that error happen again? This is why the FDA and other regulatory agencies want you reporting. Perhaps the user error occurred due to unclear instructions, for example. This would be a clear case for requiring remedial action. A common mistake we’ve seen is companies failing to file an MDR for a complaint or incident that occurred in another country. This is likely to get you a warning letter. Basically, the FDA wants to see that all complaints are investigated properly and reported appropriately for any medical device that is used and sold within its jurisdiction. It doesn’t matter that the incident originated offshore as it could be something that occurs within the USA, too. The second question pertaining to investigation is a common stumbling block among medical device manufacturers, who often overdo things and look to investigate everything, or miss investigating where they are required to do so. In the event the issue is similar to other previous complaints where an investigation has already been conducted, then conducting another investigation may not be warranted. There is no need to double-up on complaint investigations if that is the case, but you should clearly note the other investigation in your write-up for the complaint that you aren’t investigating. As always, a clear documentation trail is key to demonstrating you have a thorough and robust complaint handling process. Failure to do so will undoubtedly result in audit observations--possibly even a warning letter. Once the company becomes aware of a customer complaint, they need to take an immediate action and perform a risk analysis to assess if the issue caused or could cause significant injury or death. Once the problem statement is described, the next step in the customer complaint process is the investigation stage. During this stage, the purpose is to determine the origins of the issue, how big the issue is (i.e. how many products are affected), if the issue relates to other products / processes, and so on. The investigation stage is an effort to assess the scope of the complaint. Note that the customer complaint is generally a singular event. This is to say that an individual complaint relates to an issue reported by one customer for a single product type. If another customer reports a similar issue, this would be captured on a separate customer complaint. If a customer reports issues about multiple products, these would be captured as separate complaints. However, if an investigation for one customer complaint applies to another related customer complaint, as we indicated earlier, it may be acceptable to leverage and apply the investigation to multiple complaint issues. This is the only situation where the FDA will find it acceptable that you didn’t conduct an investigation. The last stages of a typical complaints process involve determining the root cause of the issue, taking action to remedy the problem and evaluation to ensure that the actions taken were effective for correcting or preventing the situation. The third question to address for a complaint relates to further corrective action. First of all, your complaint handling and CAPA are two very distinct processes that you must have documented separately. However, an output of your complaint handling process will be to determine if further corrective action is required in the form of a CAPA. If you determine no CAPA is required, document the rationale as to why. It is common, though, for a complaint investigation to feed into CAPA. Just as you are required to document and investigate complaints, you’re expected to do the same for CAPA as part of your QMS according to your CAPA procedure. In many ways, your complaint procedure should mirror what you do for CAPA anyhow. Both rely on root cause analysis to get to the bottom of an issue. The intent is to get to the root cause of the issue so that actions may be taken to truly correct and prevent this from happening again. Importantly, for complaint or CAPA procedures, the last step is an effectiveness verification to determine how effective your remedy has been. This step evaluates the actions taken and summarizes the evaluation period to ensure that they have been effective. While you hope to keep complaints to a minimum, the chances are you will get them at some point. 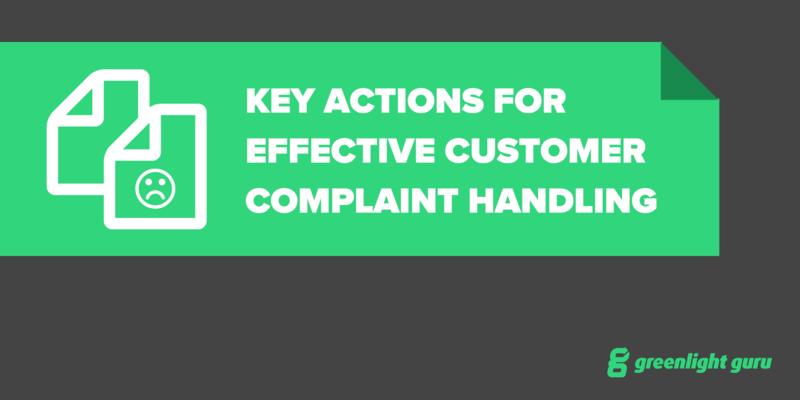 It’s not necessarily a business-breaker, but make sure you have in place a good complaint handling procedure and learn what you can from the experience. Remember that, while you are required to have a documented procedure in place and prove that you use it where needed, your complaints process doesn’t need to be another “checkbox” item. It should be taken as an opportunity to assess what you do and make improvements where possible.